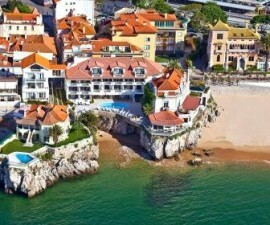 The five-star Hotel Cascais Miragem offers a luxury accommodation choice right on the shores of the Atlantic Ocean, just 25 minutes’ drive from the Portugal’s leading International Airport at Lisbon. The hotel offers a full range of double and twin rooms, deluxe rooms, junior suites and even a presidential suite for something a little bit special. The 37 All standard rooms come with luxury en-suite marble bathroom and are positioned to offer attractive views over the delightful landscaped gardens, Cascais or Estoril and contain either twin or king size beds. Suites are larger, at 80m2 and come with separate sitting room and a wide terrace offering panoramic views of the surrounding area. The en-suite marble bathrooms all feature hydro-massage baths and a separate spacious shower and wonderful views out across the rooftops or over to the Atlantic. 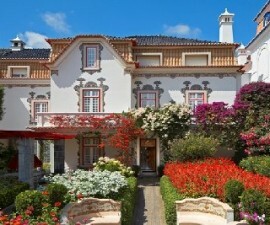 The jewel in the crown of the Hotel Cascais Miragem is its Presidential Suite. This expansive accommodation is an impressive 110m2 and comprises a grand entrance hall, guest bathroom, sitting room with dining facilities large plasma TV and DVD, bedroom with walk-in wardrobe and a luxury marble bathroom with Jacuzzi, TV and Chopard accessories. A panoramic terrace wraps its way around the suite ensuring unmatched views of the Estoril coast, Cascais Marina and the gently rolling waves of the Atlantic Ocean. The hotel is famed for its in-house Zensations Spa in which a range of health and beauty treatments is on offer to all guests in its seven treatment rooms. An adjoining lounge area with views out to sea provides the perfect place to relax after your treatment and enjoy the beauty and serenity of your surroundings. For guests who prefer a little more activity the hotel offers a Holmes Place gym incorporating over 3000m2 of workout equipment, fitness studios with a regular class timetable and indoor heated pool along with a Jacuzzi, sauna and Turkish bath in which to relax after a vigorous training session.